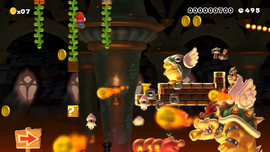 Cat Peach's Course is an Event Course in Super Mario Maker released on November 10, 2015. It unlocks the Cat Peach Mystery Mushroom costume upon completion. The level begins with an entire horde of enemies, along with some beanstalks. Mario must jump on top of a ? Block, hit a Hidden Block with a beanstalk, then head right upon climbing to the top. Mario must then jump onto a falling Lift, then jump again, clipping the wall and hitting the ax to clear the level. This course was made by Cat Peach from The Cat Mario Show, a video series available on Nintendo eShop and YouTube. It's a super-difficult course, jam-packed with enemies. But if you keep trying and don't give up, you will surely succeed. ...Eventually! This page was last edited on September 8, 2017, at 17:05.